On the first day of Fall 2017 classes at the University of Kentucky, Dr. Kim White kicked off her course with a question. Dr. Kim White leads a UK class of pre-practicum students meeting at Garden Springs Elementary in Lexington. “Today is maybe your 16th first day of school, but today is the first day of school for me, also. I wonder if you know what year, as far as how many years I’ve been teaching,” she asked them. The first student to raise her hand guessed it was her 30th year teaching. White said it was her 34th first day of school, and told them briefly about her career as an elementary teacher and college instructor. 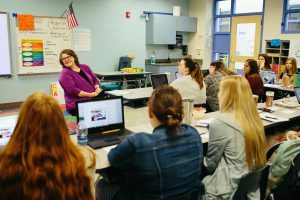 Mostly juniors, the students in White’s class were all accepted into the college’s teacher education program last semester, where White is on faculty in the elementary program in the Department of Curriculum and Instruction. The first day of UK classes marked the first time for them to do coursework directly linked to their path to teacher certification. During their first semester in the program, they will take courses about teaching language arts and classroom management. UK student Rachel Immerman works with students from her pre-practicum placement during their time in the Garden Springs Library. As they went around the room and introduced themselves, some cited being from locations around Kentucky such as Mt. Vernon, Owensboro and Louisville. But several have many miles between home and campus, such as those from California, Maryland, Texas, New York, Indiana, Missouri, Ohio and Illinois. The distance from home spoke to their professor, whose daughter recently attended college in Wyoming. She told the class to write her phone number down inside their packets. 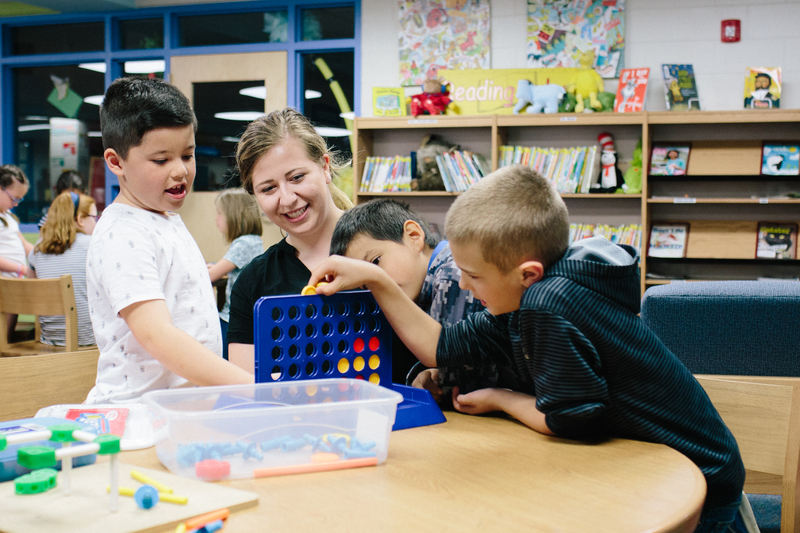 White and more than a dozen additional faculty members in the elementary education program will see the students through four semesters of coursework and placements in schools. A hand-drawn map of Lexington hung on the wall of White’s class, and had sticky notes representing elementary schools around the city. White explained to her students they will attend her class on Mondays and Wednesdays, while Fridays are reserved for observation and practice in schools, known as the “pre-practicum” phase of teacher training. The students were asked to come up and put their name under the school of their choice. Some chose the school based on its proximity to campus so they could drive there easily between classes. Those with more flexible class schedules selected schools close to where they live or that offered hours during a time convenient to them. In a pilot program, some UK students take White’s course off-campus, embedded at Garden Springs Elementary and also do their pre-practicum placements with teachers at the school as soon as White’s class dismisses. Senior Rachel Immerman took the embedded version of the course last year. “By going to class in a room at Garden Springs, we would see our students in the hallway, hear their morning announcements and feel involved in the school,” Immerman said. Yesmina Zakharia is currently taking the version of White’s class that meets on the UK campus. She chose to do her pre-practicum at Veterans Park Elementary. Zakharia, like many in the program, already has school experience. She has been working during college at The Lexington School in its after-school program. Other students have gained experience through activities such as the EdLife Living Learning program, where they live in a residence hall near students with the same academic focus. There, they gain hands-on learning experiences, interaction with faculty and upperclassman peer mentors, special courses connected with the programs and the chance to lead and teach others. Students in UK’s teacher education program will ultimately have a unique first day of school – their first day as a teacher. It’s something sophomore Shelby Haarman, who will apply to the teacher education program in the spring, is eagerly anticipating. “I look forward to teaching kids for the rest of my life,” she said. For more information on becoming a teacher, click here.